Ramen is HOT in Boston! [Mike Daikubara in Boston] I remember many years ago, it felt like there was a brand new Ramen shop opening up every month in New York city. 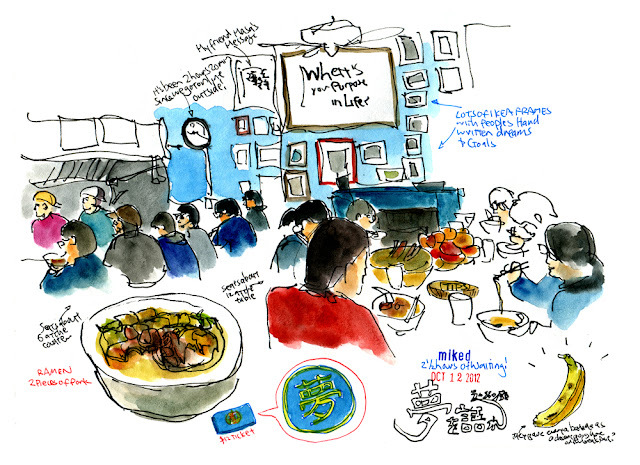 Now NYC is filled with great Ramen shops that you could only once get a taste of in Japan. Fast forward to 2016 and Boston is finally starting to boom too! 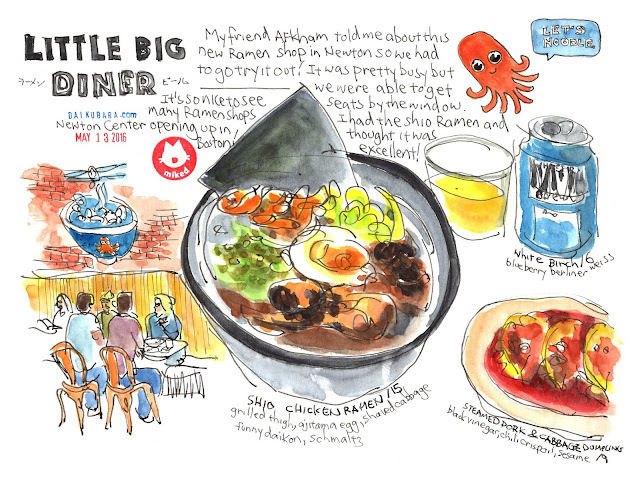 Little Big Diner (1st Sketch) in Newton is probably one of the more newer places to open up and I had the Shio Chicken Ramen which was excellent! They had a number of nice looking appetizers and a nice selection of alcoholic drinks too. I'll be sure to be back! Snappy Ramen - They have stores named Snappy Sushi too and I've been to the one on Newbury Street as well as the one in Davis square. 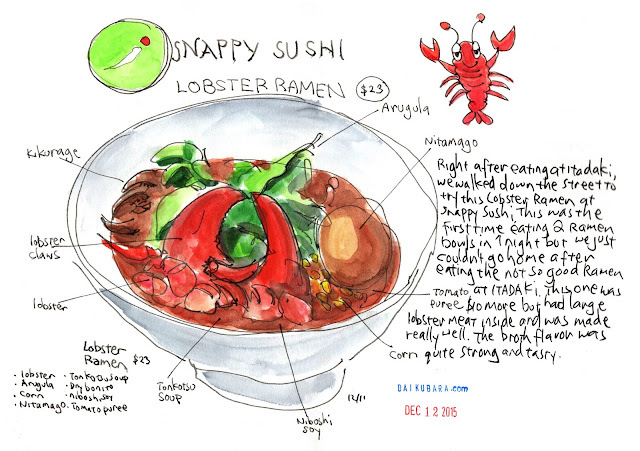 This sketch is from the Newbury one and it was my very first 'Lobster Ramen'! This Ramen was actually more of a novelty item and was fun sharing with friends. I thought their more standard ramen dishes offered at the Davis Square store was much better. Yume wo Katare This place has been super popular ever since they opened up 3 1/2 years ago. 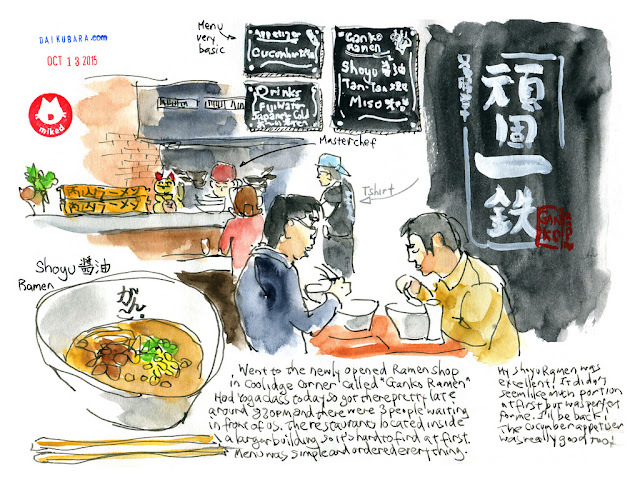 known for their Jiro-kei style Ramen, the place usually has people waiting in line for hours to get in. I thought the taste was really good but portion wise, I couldn't even finish 1/2 of the ramen bowl since it was so big. I have numerous friends who swears by this ramen and their large portion so if you're super hungry, this is the place to go! Santouka Ramen This ramen shop originally from Hokkaido is probably one of my favorite places in Boston. 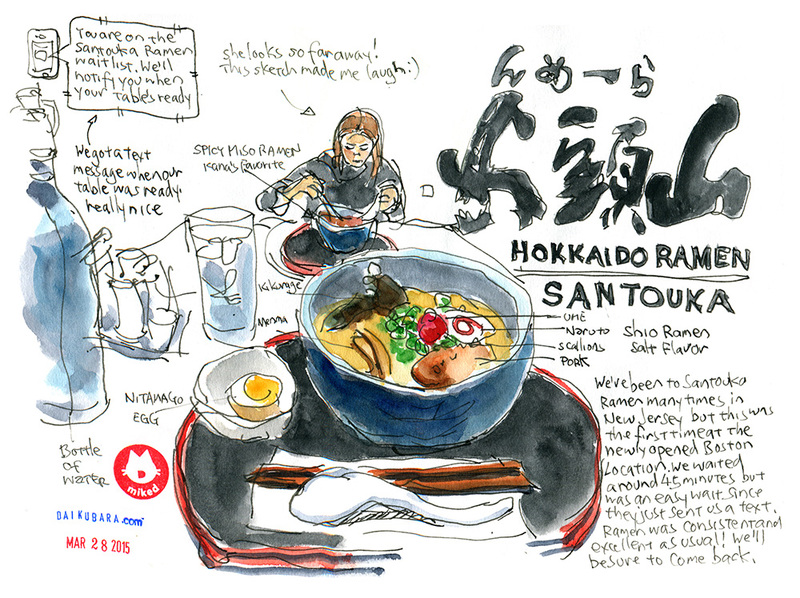 I used to visit New Jersey to see my father quite often and used to always have a bowl of Santouka before returning to Boston. Well, now it's open in Harvard square and it's really good! Ganko Ramen This place in Brookline opened up about 8 months ago and really enjoyed the overall presentation of the place. The menu is simple ( I believe only 4 dishes and couple of drinks), the interiors simple and calming too. I really like this place.